The most favorite section in weddings, birthdays and other parties is probably the dessert buffet. It is a place that both kids and adults love because of unlimited sugar and sweets. I also had a simple purple and pink dessert buffet on my birthday, but today I am sharing the beautiful purple dessert buffet which I saw during the launch of Cadbury Dairy Milk Chocolate Fountain over three weeks ago at SM Megamall. First stop, elted Cadbury Dairy Milk Chocolate fondue with white mallows and purple grapes. 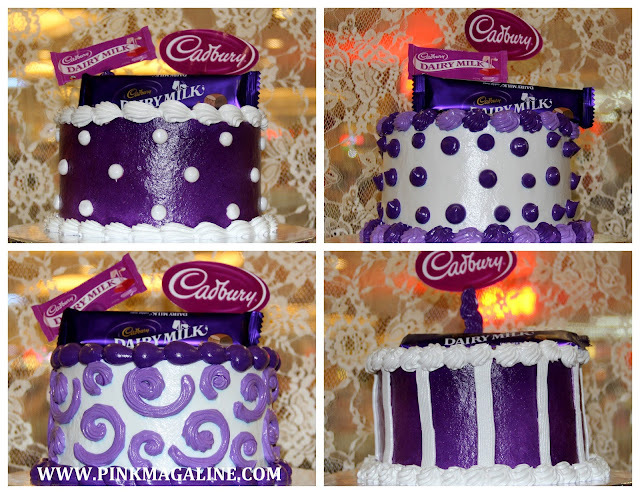 Then there was this cake with purple frosting, topped with a bar of Cadbury Dairy Milk Chocolate. More cakes choices, everything with white and purple frosting too. And these? These are chocolate truffles ala Cadbury. Something that I really liked.. the chocolate cake pops.. Yum! That's the entire presentation of the purple dessert buffet of Cadbury Dairy Milk. Lovely isn't it? There you go. If you are planning to have a DIY dessert buffet or dessert bar for your own party, just decide which color or theme and pick sweets, cakes, cupcakes, etc. with your chosen color, arrange them elegantly, and viola. If you are on a budget, you may opt for a healthier dessert buffet composed of fresh fruits or homemade goods like cookies, brownies, cupcakes, polvoron, etc. and I promise you, you will surely save money with it. I did it once and I'll surely do it again in the future. the cakes look very pretty! i'm sure my little girl would love this. Super inggit ako when I saw this! This is really a great idea for parties. I wish I was also there to try the yummy goodies by Cadbury. dessert buffets are the IN thing lately. my former blockmates from college are establishing a dessert and candy buffet business that can be customized according to the party's theme. ;) but those chocolates you posted are heavenly! i'll never get tired of eating cadbury. hehe. My son will surely have a blast seeing all these Cadbury sweet treats! Too bad, I wasn't invited to this event. Sigh!